The City of Brotherly Love showed love for sisterhood as well when it hosted the fourth Era of Hope meeting, one of the premiere breast cancer research conferences in the United States. Berkeley Lab was well represented, with more than a dozen researchers participating through either talks or posters. The conference, held June 8-11, was sponsored by the U.S. Department of Defense Breast Cancer Research Program, the second largest funding agency for breast cancer research in the country. Some 2,0000 scientists, physicians, breast cancer survivors, policymakers and advocates gathered at the Philadelphia convention center to pool their knowledge and ideas in the ongoing search for improved diagnostics and treatments for the second leading cause of cancer death among women of all ages. One out of every eight women in this country will develop breast cancer in her lifetime, and one out of every 33 will die from the disease. In 1992, the U.S. Congress directed DOD, through the U.S. Army Medical Research and Materiel Command, to manage intramural and extramural research programs that focused on breast and other deadly cancers. Since then, DOD’s Breast Cancer Research Program (BCRP) has awarded approximately $1.7 billion in grants to more than 4,000 projects, making it the second largest funding source for extramural breast cancer research in the world. The central question posed at the 2005 Era of Hope meeting was “Where are we in the conquest of breast cancer?” Scientists who received funds from DOD’s BCRP from FY 2001 through FY 2003 were required to attend the meeting and report on their research findings. Also invited to present abstracts were scientists who received DOD BCRP funds from 1992 to 2000. Participation of breast cancer survivors and advocates has been a tradition at the Era of Hope meetings in acknowledgement of the pivotal role played by Philadelphia attorney Fran Visco and her National Breast Cancer Coalition in securing the original funding for DOD’s BCRP. 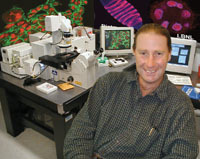 David Knowles presented a new image analysis technique for breast cancer research. Berkeley Lab Distinguished Scientist and leading breast cancer researcher Mina Bissell not only served on the technical planning committee for the meeting, but also delivered one of most heavily attended and best received talks. Speaking at the Innovator Session on June 11, Bissell, who in 2001 received a $3 million, four-year “Innovator Award” from DOD’s BCRP, described her work on the role that the microenvironment plays in determining a cell’s phenotype and how this phenotype can trump a cell’s genotype. 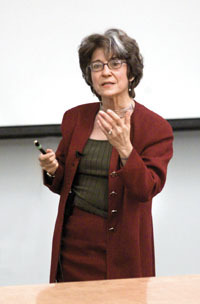 Bissell first made her mark in breast cancer research when she identified the critical role played by the “extracellular matrix,” a network of fibrous and globular proteins that surround breast cells. In experiments with tissue cultures and mice, it has been shown that the microenvironment surrounding a cell is crucial to the normal functioning of breast cells, and that aberrations in that microenvironment can lead to malignancy. In her talk, Bissell described how manipulation of the microenvironment surrounding a breast cell can allow malignant cancer cells to revert to a normal appearance and behavior, and can determine how a malignant cell responds to therapeutic agents. She also cited the crucial need for alternative models of human diseases, such as breast cancer. An excellent example of the power of 3-D cell culture models was presented in a symposium talk by Life Science’s Celeste Nelson, a collaborator of Bissell’s. Such models, she said, were used to study the effects of a stromal cell surface molecule, called epimorphin, on morphogenesis. Mina Bissell, who served on the conference's technical planning committee, discussed her ongoing breast cancer research during a well-attended presentation. Stampfer and her long-time collaborator, Life Sciences biologist Paul Yaswen, each gave talks on the use of human mammary epithelial cell (HMEC) cultures to study telomeres, the structures that protect the ends of chromosomes and enable tumor cells to grow and divide indefinitely. In her latest studies, Stampfer said, among other goals, she wants to test the hypothesis that the small amounts of telomerase synthesized in newly immortalized HMECs protect the telomeric ends and suppress the genomic instability seen during agonescence. Yaswen discussed cooperative interactions during HMEC immortalization, and how genetic analyses has shown that the expression of more than 1,500 genes are deregulated by genome aberrations in breast cancer. “What causes the genetic instability and what, if anything, do the individual genetic aberrations contribute to the malignant phenotype?” Yaswen asked. From studies of telomerase activity in the tumor cells, Yaswen suggested that augmenting the processes that monitor and prevent the growth of cells with dysfunctional telomeres may be useful for preventing immortalization and malignancy. Although the Era of Hope meetings primarily serve as a forum for exchanging ideas, some new research developments were announced. Among them was the report of a novel image analysis technique that links the distribution of proteins inside the cell nucleus with cell phenotypes in breast cancer. This technique was described by Life Sciences’ biophysicist David Knowles. Among other applications, this new technique, he said, could be used to make an early distinction between benign and adverse lesions. More detailed stories on the Era of Hope 2005 meeting and the presentations given by Berkeley Lab researchers will appear in [email protected] Berkeley Lab, the Lab’s online feature magazine (http://enews.lbl.gov/). 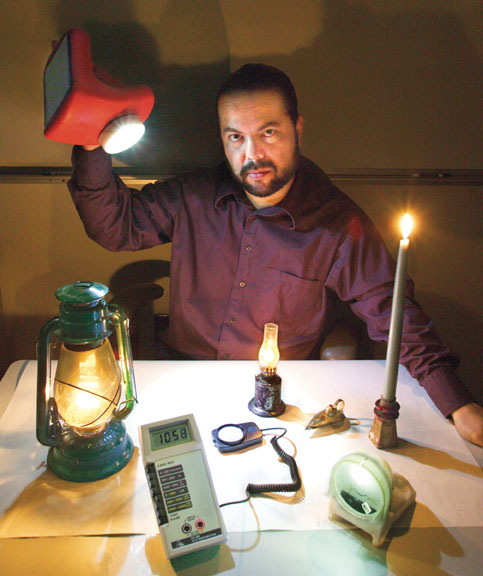 EETD�s Evan Mills holds his prototype white-light-emitting diode (WLED) made by a company called Ignite Innovations. A honeymoon trip six years ago, which included a visit to an ancient and secluded kingdom high in the Himalayan mountains, led to a recent article in the journal Science by Evan Mills, an energy efficiency expert with the Environmental Energy Technologies Division (EETD). 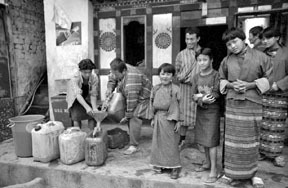 When Mills and his bride, Erika, traveled across Bhutan, a country located in the eastern Himalayas between Tibet and the Indian territory of Assam, he saw and personally experienced the population’s heavy dependence on inefficient, air-polluting kerosene lamps for artificial lighting. The experience was a scientific epiphany. Mills’ research interest has led him on an odyssey throughout Asia, including the countries of India, China, Cambodia, and Vietnam. Based on his field observations and studies, he published an article in the Policy Forum section of the May 27 issue of Science, in which he proposed that kerosene and other fuel-based lighting systems in developing nations be replaced with highly efficient, cost-effective white-light-emitting diode lighting systems. Such systems would be integrated with simple optics, a small solar panel the size of a paperback novel, and rechargeable AA batteries, and would have the potential to save tens of billions of dollars per year worldwide in energy costs. These systems would also dramatically reduce carbon dioxide emissions. A tailor in India works by candlelight in an "electrified" village. Mills also calculated that fuel-based lighting is responsible for about 190 million metric tons of carbon dioxide emissions per year, equivalent to one-third the total emissions from the United Kingdom. Solid-state white-light-emitting diodes (WLEDs) produce light when an electric current passes through a semiconductor chip. Because the electricity is directly converted to light, as opposed to light being produced by heating a filament until it glows, WLEDs are energy-efficient. Although the cost of manufacturing WLEDs is still relatively high compared to incandescent and fluorescent lights, it is rapidly falling. In his article, Mills made the case that WLEDs are especially well-suited for use in developing nations. Remote roadside kerosene stations such as this in Wamrong are common throughout Bhutan, a country in the eastern Himalayas, where 85 percent of the population lives at least a one-hour walk from the nearest road. For half the population the trip takes a day. Mills estimates that solar-powered WLED systems could appear on the market for as little as $25 without the need for a subsidy, and will pay for themselves in less than a year. The fuel savings would represent an ongoing annuity, equal to a month’s income each year for the poorest 1 billion people in the world, who live on less than $1 a day. A key point in Mills’ proposal is that, in the case of artificial lighting, it is possible for developing nations to attain a higher standard of living while lowering energy use, but policy makers have yet to adequately address the issue. The choices he presents are clear. Most people throw away old car air filters. Al Smith collects them. Every few days for the past four years, Smith, a Berkeley Lab physicist, has stopped by the City of Berkeley’s Public Works Depart-ment to pick up an armful of police car air filters. He takes the filters to Berkeley Lab’s Low Background Facility, where a high-resolution gamma spectrometer analyzes them for the telltale signs of radioactive substances, which could indicate that terrorists have released harmful radiation somewhere in the Bay Area. “We haven’t detected anything that shouldn’t be there,” says Smith, who has analyzed about 1,000 filters so far. Now, Smith and several colleagues are working to take this cheap but highly sensitive early-warning system nationwide. They’re patching together a network of high-resolution gamma spectrometers located near major population centers throughout the United States. The project, which was competitively selected from over 3,000 submissions in 2003, is funded by the Department of Homeland Security and managed by the Technical Support Working Group, a government group that coordinates R&D projects aimed at combating terrorism. So far, Smith, with the help of retired Berkeley Lab physicist Richard McDonald and project leader Kevin Lesko of the Nuclear Science Division, has secured informal agreements from the DOE, federal agencies, and university labs located near New York City, Boston, Washington, D.C., Seattle, and several other cities. If a dirty bomb is detonated, air filters analyzed by these detectors could provide an early and effective indication of the epicenter and scope of the attack. They could also help officials pinpoint contaminated areas that must be evacuated, people at particular risk, and safe havens where people could seek refuge. Smith’s idea to use air filters to monitor for airborne radiation dates back to 1986, when the Chernobyl disaster spewed a radioactive cloud into the atmosphere. He and his colleagues set up a sampling station at the Lab’s firehouse to test for the cloud. The first radionuclides appeared about two weeks after the accident, representing a round-the-world journey the radioactive cloud would make four more times. Fifteen years later — and a few weeks after September 11, 2001 — he again thought of car air filters. Perhaps they could monitor the air for the signs of a dirty bomb or terrorist-related radiation release. In order for this to work, however, he needed a steady supply. He chose Berkeley’s police cars for several reasons: they have regular routes, are in constant use, and have a routine maintenance schedule — meaning in the event of an attack, it’s possible to quickly determine which areas have been affected by radiation and which have not. Smith and Berkeley Lab employee Donna Hurley also routinely analyze air filters from sheriff’s cars that patrol Oroville, Calif., where another Berkeley Lab-operated gamma spectrometer is located. Smith and his colleagues are also working to determine the background levels of radionuclides normally captured by air filters throughout the U.S. He has collected and analyzed filters from 12 police departments that serve major cities. This work is critical because air filters are highly sensitive, able to capture very low concentrations of beryllium 7, a naturally occurring isotope formed high in the atmosphere by cosmic rays. They also capture cesium 137, a very rare isotope left over from the nuclear weapons tests of the 1950s and 1960s. Ultimately, Smith envisions a national network of highly sensitive detectors such as Berkeley Lab’s gamma spectrometer, which can determine the type of isotopes present in filters. These detectors would be fed by a much larger number of less sensitive but cheaper detectors used to screen filters for the presence of radioactive substances. More funding is needed to make this system a reality, but Smith believes Berkeley Lab is uniquely qualified to shepherd the project along. Concerned about the safety of its passengers and increasing construction traffic both on-site and off, the Transportation Depart-ment has adjusted Berkeley Lab’s shuttle bus schedule for both Hearst Avenue and on-site routes. All “stop” intervals will be 12 minutes long — two minutes longer than before — and bus drivers will be less willing to accommodate late-arriving passengers. This all starts next Monday. Specific schedules on arrival and departure times for both routes can be found on the bus website at www.lbl.gov/Workplace/Facilities/ Support/Busses/. The 12-minute intervals are in effect Monday through Friday on the Hearst route from about 6:20 a.m. until 6 p.m., and for the on-site route from 6:45 a.m. to 5:10 p.m. The buses will run at 24-minute intervals outside those times. The last buses leave Building 65 at 6:44 p.m. Drivers will now use their turn signals to indicate when the bus is or is not available for boarding. When the curb-side signal is flashing, the bus is ready for boarding. When the street-side signal is flashing, the door will be closed and will not reopen until the bus reaches the next scheduled stop. The bus driver will not stop for passengers approaching the bus once the door is closed and the bus is pulling away. Running to catch a departing bus is especially discouraged, due to a recent series of injuries that have resulted. Riders are encouraged not to step out in the street to “flag” an approaching bus. All scheduled stops will be made, and “flagging” only endangers the rider. These new rules apply to off-site shuttle stops and on-site stops, in particular at the main turnaround at Building 65. For Steve Chu at the kickoff event in this year’s Summer Lecture Series on Wednesday, it was all about the machines. And then there were the machines about which he spoke so reverentially — exquisite nature-made biological systems that he and other scientists are just starting to figure out. A physicist who made his name developing the “optical tweezers” that allow manipulation of atom-sized parts in the laboratory, Chu illustrated to his rapt audience how the theories and methods of a physicist are used to decipher the complex codes of biology — how, in essence, one discipline needs the other in today’s world of modern science. It was an apt illustration of the value of physics in this “World Year of Physics 2005,” to which this year’s seven-lecture series is dedicated. Chu’s research group, and others at Berkeley Lab and elsewhere, are studying the mechanics of the machine that “reads” RNA and triggers the process in which amino acids, the building blocks of proteins, are formed. It’s called a ribosome, which Chu described as a “huge molecule, 250 atoms across, with lots of pieces.” And efficient. We can learn from these intricate systems, Chu seemed to be saying (relating the wisdom of one of his favorite philosophers, baseball catcher Yogi Berra: “You can see a lot by watching”), and he proceeded to describe and illustrate the painstaking work of his group to understand the various chemical reactions and bonds involved in the transfer and translation of RNA — a process that looks at one molecule at a time. One step took a year and a half to complete. “The ribosome is even more clever than the theoretical physicist imagined,” he said. He also touched upon work with neurons and the motor molecules that impact brain function. It’s all part of this mysterious biological world that physics principles and techniques are helping to conquer. So where does the leader of this country’s most prestigious research laboratory find the time to dabble in the intricacies of biology? Physicist Carl Haber and colleagues have figured out a unique way to apply the same technology used to study subatomic particles to restore the music and voice preserved in aging historical discs and cylinders. The process involves imaging the grooves in a recording similar to measuring tracks in a particle detector. 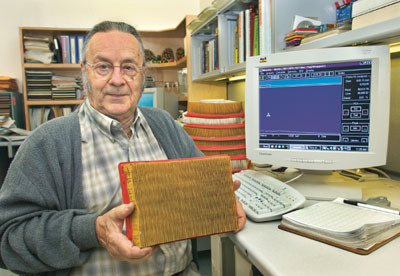 These digital reproductions of mechanical recordings will be demonstrated as part of the presentation. Physicist Natalie Roe will explain how, shortly after the Big Bang, matter and antimatter particles were present in equal numbers in the universe, but they soon began to annihilate one another. In the process, a small excess of matter (1 part in 10 billion) was left over, and these leftovers became our universe. Roe will describe how scientists are trying to understand how this matter survived, and what implications it has for the fate of the universe. Diversity is a common buzzword these days, but Berkeley Lab’s Best Practices Diversity Council is working to make it a reality. The group has unveiled several principles designed to encourage a diverse workforce and emphasize the core values of integrity, respect, fairness, and excellence. 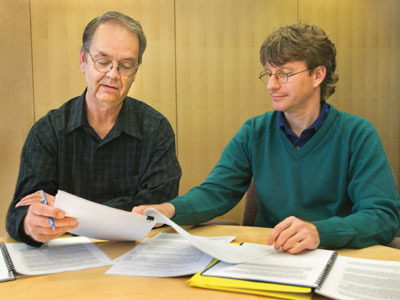 Gary Krebs (left) and Mark Biggin of the Diversity Council read over the diversity principles. The Best Practices Diversity Council was formed by former Lab Director Charles Shank in 2003 to strengthen the Lab’s diversity efforts. It is made up of 21 representatives from each division and the Work-force Diversity Office, the Human Resources Department, and the Center for Science and Engineering Education. Its goal is to identify and share practices that have enhanced diversity at other institutions. The newly unveiled diversity principles, which were drafted by the group and recently approved by Director Steve Chu, are one such best practice. Other institutions have used diversity guidelines to foster a culture in which employees appreciate diversity of all kinds and treat others with respect and dignity. Berkeley Lab’s Diversity Council hopes to promote the same environment at Berkeley Lab. Another Diversity Council initiative designed to encourage labwide diversity is a strategic recruitment plan, which is currently a pilot program in the general science divisions. Other divisions also have various stages of this program in practice. Under the program, divisions should establish a recruitment process that ensures a broad applicant pool. In addition, if a job category exists where underrepresented groups are identified, hiring goals should be set that reflect programmatic needs and workforce availability. “Hiring the most qualified person is always the first priority, but we want to attract a diverse pool of applicants,” says Krebs. The strategic recruitment plan is a commitment made to DOE under the new management contract that requires Berkeley Lab to utilize industry best practices to improve diversity. Best Practices Diversity Council members include Gary Krebs, ALS; Harry Reed, Operations Division; Penny Huang, Operations Division; Ed Sayson, Human Resources; Mark Biggin, Life Sciences Division; Gerald Abrams, Physics Division; Richard Diamond, EETD; Mary Gilles, Chemical Sciences Division; Enrique Henestroza, AFRD; Stephen Holbrook, Physical Biosciences Division; Peggy Norris, Nuclear Science Division; Rollie Otto, Public Affairs; Juan Meza, Computational Research Division; Amy Pagsolingan, Human Resources; George Reyes, Facilities Division; Weyland Wong, Engineering Division; Eugene Lau, EH&S Division; Jeffrey Fernandez, Office of CFO; Hoi-Ying Holman, Earth Sciences Division; and Oscar Dubon, Materials Sciences Division. Lawrence Berkeley National Laboratory is principally an institution of scientific research, committed to addressing the needs of society. A diverse workforce is an invaluable asset to innovation and research excellence. To this end, we must embody the following principles to successfully affect the Laboratory’s mission and embrace our diverse workplace community. We affirm the inherent dignity in all of us and strive to maintain an environment characterized by respect, fairness and inclusion. Our valued community encompasses an array of races, creeds, and social circumstances. We recognize and cherish the richness contributed by our diversity. We accept open expression of our individuality and diversity within the bounds of courtesy, respect and sensitivity. We take pride in our collective achievements. We honor our differences. As mandated by law and reaffirmed here, we will not tolerate any manifestations of discrimination, including those based on race, ethnicity, gender, age, disability, sexual orientation, religious or political beliefs, and status within the Laboratory. The Bay Area Laser Safety Officers met at Berkeley Lab on Wednesday, June 15 to hear Lab Director Steven Chu discuss the key roles played by lasers — several of his own design and construction — in his scientific career and those of many of his colleagues. Ken Barat of Lawrence Livermore National Laboratory chaired the meeting, attended by 16 members including Ted deCastro, Berkeley Lab’s laser safety officer, and Gary Zeman, the Lab’s radiation control manager, both of the Environment, Health & Safety Division. Zeman introduced the Director, remarking that he’d invited Chu to address the meeting after learning that he’d used lasers to win his 1997 Nobel Prize. Chu underscored the strides that have been made in recognizing the dangers posed by these essential scientific instruments, and his anecdotes touched on issues that laser safety officers must contend with routinely. As a graduate student and postdoc at UC Berkeley in the 1970s Chu tackled a variety of projects, but most fruitful was the state-of-the-art laser he painstakingly built from scratch to test the Weinberg-Salam-Glashow unified theory of the electromagnetic and weak forces. The device was touchy but finally produced the proof; unfortunately Chu was beaten to the punch by particle experiments at the Stanford Linear Accelerator Center (SLAC). Chu showed a slide of himself with this laser, prompting one member of the group, Cathi Scogin, to point out that he is not wearing safety glasses. (Perhaps not coincidentally, Scogin represents the Glendale laser eyewear company.) Chu said that many safety measures now considered indispensable were unappreciated in the 1970s. Worst of all, he said, was that the laser’s flashlamps exploded so often under high voltage that his colleagues stopped running in to make sure he was all right. Chu designed more innovative lasers at Bell Labs, culminating in successful experiments to cool and trap atoms, work that later won him the Nobel Prize. The techniques were modified and extended. 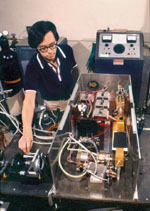 At Stanford, where Chu moved in 1987, they were the basis for the atomic fountain, which now provides the world’s most accurate clock, and for such devices as “optical tweezers” for manipulating cells and molecules. Currently Chu maintains a research program using lasers in projects such as the construction of a neural network — an artificial one, but using real nerve cells. Near the conclusion of the talk, Ken Smith, radiation safety officer and laser safety officer at UC Santa Cruz, asked Chu to comment on the fact that safety officers are often viewed as a hindrance to research. Semiconductors make computer chips, photovoltaic cells, light-emitting diodes (LEDs), digital cameras, and other gadgets possible because of their peculiar electronic and optical properties, described by terms like “band gap” and “dielectric constant.” Semiconductor quantum dots are weirder still. The optics and electronics of q-dots, tiny crystals consisting of a few hundred to a few thousand atoms, are dramatically different from the same materials in bulk. 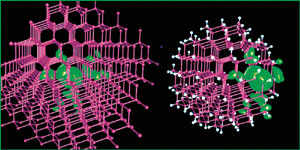 The green shows the change in charge response when a single-electron perturbation is introduced into bulk gallium arsenide (left) and into a 465-atom quantum dot of the same material near its surface (right). Except where the dot's surface intervenes, the responses of the two systems are very similar. A quantum dot’s electric constant is the average of its dielectric function (a term indicating how charge responds to an electric field) everywhere inside the dot. It turns out that q-dot dielectric functions have been misunderstood for over a decade. When Wang and postdoc Xavier Cartoixà learned that French researchers led by Christophe Delerue of the Institut Supérieur d’Electronique du Nord had raised doubts about the assumed relationship between a quantum dot’s band gap and its dielectric function, they decided to test the French group’s approximate calculations by performing the first-ever microscopic studies. They modeled the electronics of quantum dots on the Seaborg super-computer at NERSC using PEtot, Wang’s quantum-mechanical electronic-structure program. Their results led them to devise the first simple mathematical model that nanoscience researchers can use for quick, consistent calculations of the dielectric function in nanocrystals. The band gap is the energy required to lift an electron from a semiconductor’s valence band to its conduction band. An incoming photon whose energy matches or exceeds the band gap boosts an electron into the conduction band, leaving behind a “hole” of opposite charge. This principle underlies photovoltaic cells, which generate electrical current when stimulated by light. Conversely, when an electron falls from the conduction band back down to the valence band, eliminating a hole, the energy lost is emitted as light whose color corresponds to the band gap — the principle behind LEDs. Quantum dots of the same material but different sizes have different band gaps and emit different colors. Each semiconductor has a characteristic band gap, but when the diameter of a piece of the material is shorter than the quantum-mechanical wave function of its electrons, the “squeezed” electron wave function makes the band gap wider. For an electron to jump from the valence band to the conduction band now requires more energy. The smaller the q-dot, the wider the band gap. The band gap of a 465-atom quantum dot of gallium arsenide is more than twice the band gap of gallium arsenide in bulk. Just adding or subtracting atoms changes a dot’s band gap and thus the color of light it absorbs or emits. The electron-hole pair formed when an incoming photon boosts an electron out of the valence band into the conduction band is called an exciton. It’s exciton energy that corresponds to the color of the quantum dot, and it’s not quite identical with the band gap, but is affected by additional factors. Most important is the dielectric function inside the quantum dot, which mediates how strongly the exciton’s electron and hole attract each other. Calculating the dielectric function is thus essential to understanding how excitons behave and how a q-dot’s electronic states can be manipulated — for example by adding a dopant atom that seeds the semiconductor with an extra electron. Wang and Cartoixà calculated what would happen if single-electron perturbations were introduced into quantum dots of different sizes and materials. At NERSC they calculated the electron charge density of perturbations throughout the dots. To their surprise, the results were virtually identical to measurements of the bulk materials — except near the surface of a dot. In small, 465-atom dots, measurements near the center of the dot were similar to the bulk but varied significantly where the perturbation vanished near the surface. It’s averaging between center and surface that makes it appear that a q-dot’s dielectric constant mimics size-dependent changes in its band gaps. In fact there is no direct relationship. The success so far of a nationwide network of partnerships created by the U.S. Department of Energy (DOE) to investigate different approaches for carbon sequestration has been recognized by the awarding of an additional $100 million for further research. Berkeley Lab is a key member of one of these award recipients, the West Coast Regional Carbon Sequestration Partnership, or Westcarb. 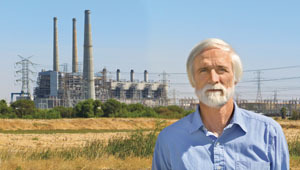 Larry Myer, a geological engineer and principal investigator with Berkeley Lab�s Earth Sciences Division, serves as technical director for Westcarb. “In 2003, we started Westcarb to identify opportunities in which carbon dioxide sequestration could be used for climate change mitigation in the West Coast states. We are now one of the seven partnerships that will move forward with the Phase II program, a much bigger, four-year effort involving field pilots in geologic and terrestrial sequestration,” said Larry Myer, a geological engineer with Berkeley Lab’s Earth Sciences Division, who serves as technical director for Westcarb. DOE funding for this advance to Phase II was announced in Washing-ton, D.C. on June 9 by Secretary of Energy Samuel Bodman in a speech before the National Coal Council. 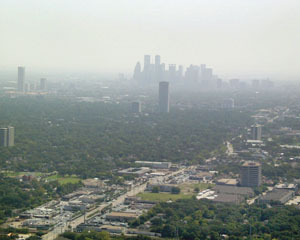 The grants are part of President Bush’s Global Climate Change Ini-tiative, which is designed to reduce greenhouse gas emissions by 18 percent by 2012, in part through the development of carbon sequestration technologies. While each of the seven partnerships is to receive between $14.2 and $14.3 million from DOE over the next four years, Westcarb is by far the largest project, with a projected total cost of nearly $30 million, thanks to the large contributions from its private partners. Westcarb is led by the California Energy Commission and includes representative organizations from California, Oregon, Wash-ington, western Arizona, Nevada, Alaska and British Columbia. Two-hundred-plus years of industrialization has resulted in the emission of an enormous amount of carbon dioxide into the atmosphere. Experts predict that atmospheric carbon dioxide concentrations will double from pre-industrial levels by the middle of this century. Although the effects of doubling atmospheric carbon dioxide levels are not entirely understood, the scientific consensus is that serious environmental consequences will result if steps are not taken to curb emissions. The goal of carbon sequestration is to prevent carbon dioxide emissions from reaching the atmosphere by capturing a significant amount at the source, i.e., power plants and industrial smoke stacks, and securely storing it where no environmental harm would be done. The region encompassed by the Westcarb member states is responsible for about 11 percent of the nation’s anthropogenic carbon dioxide emissions. More than two centuries of industrialization have resulted in a near doubling of atmospheric carbon dioxide. The goal of carbon sequestration is to capture CO2 emissions at the source and store them where no environmental harm would be done. Under the grants award to Westcarb for the Phase II studies, researchers will initially run two geologic tests near Rio Vista, a small town in Solano County about 40 miles northeast of Berkeley. Two thousand tons of carbon dioxide gas, purchased from a refinery, will be injected into the depleted portion of a large natural gas reservoir, and 2,000 tons will be injected into a saline formation beneath the gas reservoir. The plan is to use the same wells to inject the carbon dioxide into both formations. These density differences will have to be accounted for when Westcarb researchers monitor the carbon dioxide gas once it is underground. The carbon dioxide is expected to move inside these formations and the researchers need to be able to record and study this movement. In addition to demonstrating monitoring techniques, Westcarb’s Phase II research will also look to validate earlier research by Earth Sciences Division scientists Curt Oldenburg and Sally Benson. They have done a substantial amount of work to show that it should be feasible to use carbon dioxide to enhance the recovery of methane from depleted gas reservoirs. If valid, this will have the potential to offset at least some of the cost of carbon sequestration. Benson will be the technical lead for Westcarb’s geologic tests in Phase II. In addition to these geologic tests, the Phase II grant also calls for terrestrial tests — storing carbon dioxide in forests and soils — and continued assessment of other potential geologic storage sites in the region. It has been estimated that the various geologic and terrestrial sequestration sites in the United States have the potential to store more than 600 billion metric tons of carbon dioxide gas. This is the equivalent of the total amount of carbon dioxide that has been emitted from all energy sources throughout our country’s history. The Lab’s new Office of Institutional Assurance is charged with ensuring that the Lab’s contract meets its compliance, scientific excellence, and best management practices and that continuous improvement is achieved. Krupnick has been a manager with the ALS since 1987. For the past six years, he has been ALS Division deputy under Director Daniel Chemla and Acting Director Janos Kirz. He will formally leave his ALS position on August 1. “Above all, our list, compiled by HPCwire with the help of past winners and a cast of industry insiders, represents the foundation of a new era in high-performance computing,” said Tim Curns, the publication’s editor. Kramer, who will chair SC’05, the international conference for high performance computing, is responsible for NERSC's computational facilities and support at Berkeley Lab. Previously he was with the NASA Ames Research Center, where he was chief of Advanced Air Transportation Technologies and was responsible for creating and implementing an R&D program for designing revolutionary new air traffic management systems. From 1988 to 1994, he was branch chief of NASA Computational Services, responsible for all aspects of operations and customer service for NASA's principal supercomputer center. Oscar Dubon, a materials science researcher with Berkeley Lab and an assistant professor at UC Berkeley, received the nation’s highest honor for scientists at the early stages of their careers at a ceremony in Washington, D.C. on June 13. John H. Marburger III, science advisor to the President and director of the Office of Science, presented the 2004 Presidential Early Career Award for Scientists and Engineers to Dubon and 57 other scientists from around the country. Dubon’s research focuses on semiconductor materials and manufacturing methods that address challenges presented by nanoscale electronics. His lab is currently investigating the growth of semiconductors on patterned and electrically insulating surfaces. Dubon’s research is supported by the National Science Foundation. Max Sherman, a scientist in the Environmental Energy Technologies Division, has received an Exceptional Service Award from the American Society of Heating, Refrigerating and Air-Conditioning Engineers (ASHRAE). Sherman is leader of EETD’s Energy Performance of Buildings Group. ASHRAE notes that one of Sherman’s biggest contributions to the industry was overseeing the committee that wrote Standard 62.2, the only nationally recognized indoor air quality standard developed solely for residences. Ads are accepted only from Berkeley Lab employees, retirees, and onsite DOE personnel. Only items of your own personal property may be offered for sale. (e-mail: [email protected] lbl.gov, fax: X6641), or mailed/ delivered to Bldg. 65. Email address are included only in housing ads. Ads run one issue only unless resubmitted, and are repeated only as space permits. The submission deadline for the July 8 issue is Thursday, June 31.